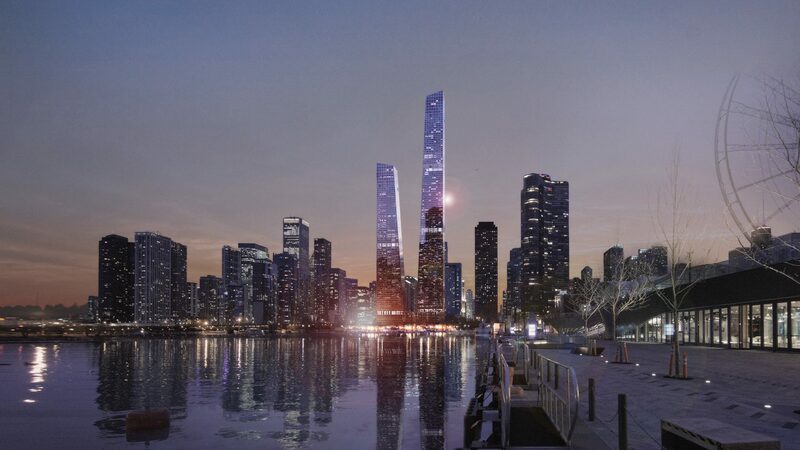 Chicago, IL – STLArchitects is one of several world renowned architectural firms that were retained by Related Midwest to design a concept for a new super tall residential development on the old Chicago Spire site. The competition, which was managed by UK’s Malcolm Reading, was held in 2016. STLArchitects’ conceptual design responds to the unique site conditions created at the intersection of the Chicago River and Lake Michigan. Designed to become a symbol for Chicago, the two super-slender towers adopt a simple yet iconic tapered geometry. The design introduces an exceptional structural design approach which completely eliminates the need for mass dampers freeing the most valuable real state space at the top of both towers. The geometry of the floor plans and the building envelope is based on a single module that provides an impressive unit flexibility and a rich façade expression.